All children love to play with toys, and what better way to encourage their growth and development than by way of educational games aimed at toddlers? It can be quite the challenge to keep up with toddlers! They run and jump around, and they can be noisy a lot of the time with the all the excitement of learning new skills. But, for all their energy and enthusiasm, they can't run around for 24 hours a day. They have to have their quiet time too. That provides a perfect opportunity for you to introduce them to the ABC's and 123's. However formal teaching methods bore toddlers very easily. The best age-specific toys for children this age will make a toddler's down time entertaining as well as educational. We've been checking out educational games for children from 2 1/2 to 3 years old, and here are our favorite picks. Just as tech nology has made its way into the daily lives of children, youth, and adults, this Reader Rabbit Playtime software has made inroads into the toddler's world. It can be hard to find computer games that are really entertaining for toddlers, more so with so many things to discover in the world around them. This software teaches rhymes, colors, matching shapes, and even animal sounds. There are so many activities to choose from, your child will be fascinated for long stretches of time. In the event that your toddler might finish all the activities in short order, he will no doubt love to return to these games to play them again and again. This is a lovely, inventive educational game for toddlers, and to make it even more attractive the price tag is one of the lowest we've seen for just about any type of educational toy. One normal developmental milestone for a three-year-old is the ability to ride her own bike. However she can't learn to do that if she has no opportunity to ride one. She could be one of the first kids to reach this milestone with the Toddler Motorbike. Unlike some other toddler bikes, this one allows your child to maneuver the steering, and it is designed to help develop balance and coordination and of course it gives them a great confidence boost. Since it's lightweight you needn't worry if the wheels will run over her little toes, and it's very easy for a parent, or even for the toddler, to carry around. She will still love riding this superMOPI even after she has outgrown it and despite the fact that it's an outdoor/indoor ride-along, it's also a surprisingly good educational game for children between 2 1/2 and 3 years old that will no doubt foster a world of good fun. "Hello! Hello!" That's what this phone says whenever you flip it open. You know how toddlers love to play imitation games; they want to be just like mom or dad when they talk on the phone. When your child became about 2 years old, he started playing with your TV remote and your telephone. 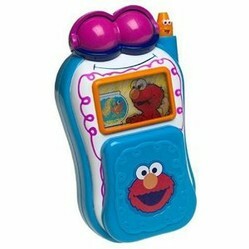 To prevent some possible disaster around your place, get your toddler his very own phone to play with. The front picture on this phone rotates every time you flip it closed. It's a compact, fun electronic toy, fascinating to little ones and there are lots of educational games opportunities with it. They get to interact, learn (through play) basic greetings and social skills, plus they will pick up on basic numbers and get to giggle with Elmo whilst they're doing it.